Heinkel Cars have 8 windows. Depending on your particular model, you’ll have either 5 or 7 windows made of plastic, and a front windshield of safety glass (there are some exceptions, if I’m not mistaken there were some early cars with all glass windows). This is the first of a multi-part series on window restoration and installation. We’ll start with the plastic windows first. Heinkel plastic windows are made of Plexiglas. Plexiglas (also called Perspex and Lucite) is a synthetic polymer, and is often confused (by people like me) with polycarbonates such as Lexan (if you want to know what the differences are, you can read about them here ). Plexiglas is lightweight, shatterproof, bendable, and relatively inexpensive, which is probably why it ended it up in these cars in the first place. 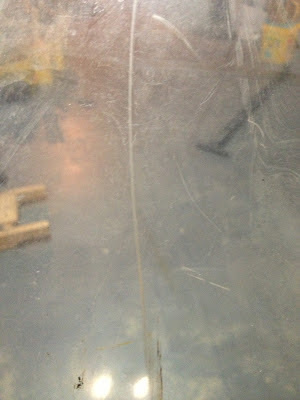 Fifty year old Plexiglass windows are not without their challenges. Plexiglas is relatively soft, so it is often scratched. It can get foggy, craze a bit, and turn yellow. 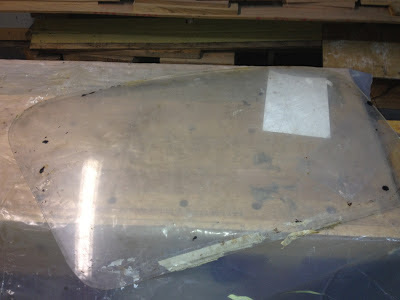 Thankfully Plexiglas is a relatively forgiving material, so you can work on it and restore most of its original luster. Before you start, you have to weigh the pros and cons of window restoration. If you live in Germany or England, or money is no object, you may want to purchase new windows from your respective clubs. If you want to buy windows, shipping to the US is much cheaper from Germany than the UK (although German windows are a bit more expensive). A Heinkel owner I know told me it cost 40 Euros to ship a rear window to the US. If you’re on a budget, or live in a place where it’s expensive to ship new windows, restoration is an economical option. Another benefit of window restoration and installation is that they are two of the most "social" of car restoration tasks. They both take a while and require at least one, if not two people to help. Don’t alienate our friends or family until you complete these jobs! Here’s a typical Heinkel side window. This one is scratched, foggy, and covered with patches of black goo. It also came loose from the car, so it’s not clear if it will fit a vehicle without needing to be cut to fit. This window has crazing. If there's a lot of this you should start with a new window. Lots of scratches, some pretty deep, are fixable. If there are scratches, how deep are they, and can you live with them? 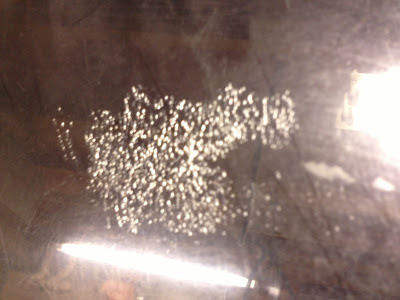 If you can feel a scratch with your fingernail, then you are going to have to remove the scratches with sandpaper, and then polish the window. 1. A helper/ window holder. The polishing part is a two person job! 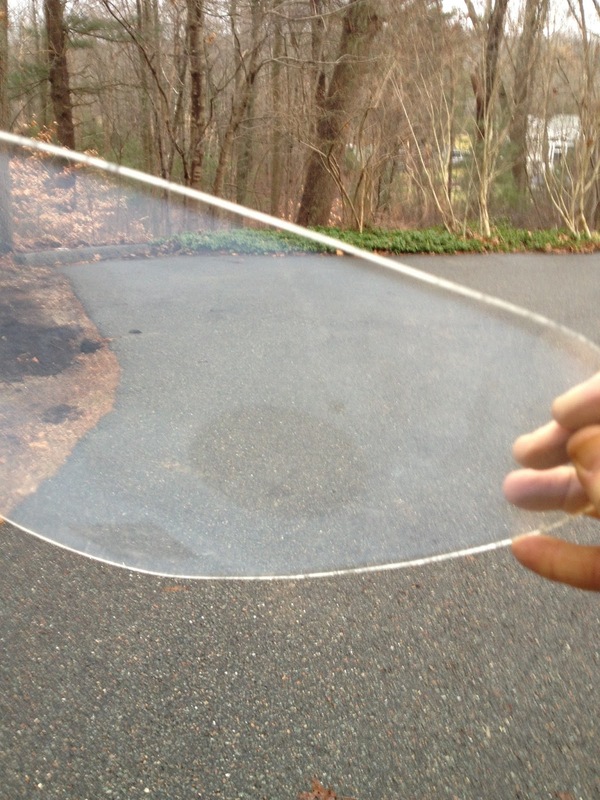 If your windows are just cloudy or very lightly scratched (highly unlikely), you can polish them with plastic polish. There are a number of polishes out there; I use polish designed for polishing acrylic pen blanks. You can also use airplane or boat window polishing “systems”, since these vehicles also have Plexiglas windows. The big difference is that you have A LOT of windows to do (probably about 50 square feet if you do both sides) and the kits can get expensive. 1. Wet the window, apply the polish, and work in a circular motion with the polisher on both sides. If the window looks good, you’re done! 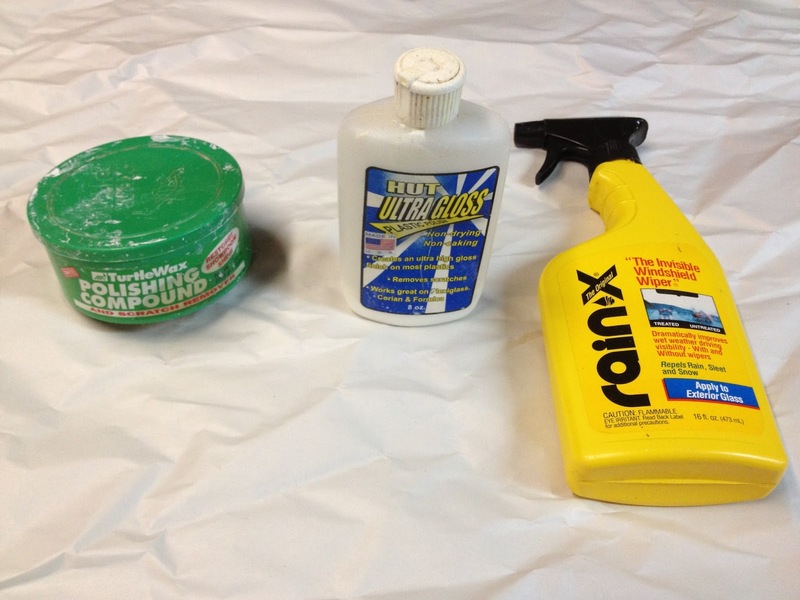 Then I would apply Rain-X both inside and out as a protective coating. Chances are you are not done, and not all of the scratches are out. As I mentioned earlier, if you can feel the scratch with your fingernail, you will need to sand. The question is, how much sanding and what grit? Here’s my rule of thumb: If you find more than 3-5 scratches that you can feel with your fingernail, I would sand the entire window, because there’s probably another 10 scratches for every one you can feel. Find the deepest scratch and sand it with 1200 wet-dry sandpaper. Don’t try to oversand. If you can’t remove the scratch, you’ll need to go down to the next level. Unfortunately in my case, I had to go all the way down to 600 to remove my scratches. You have to be in the right mood to sand. 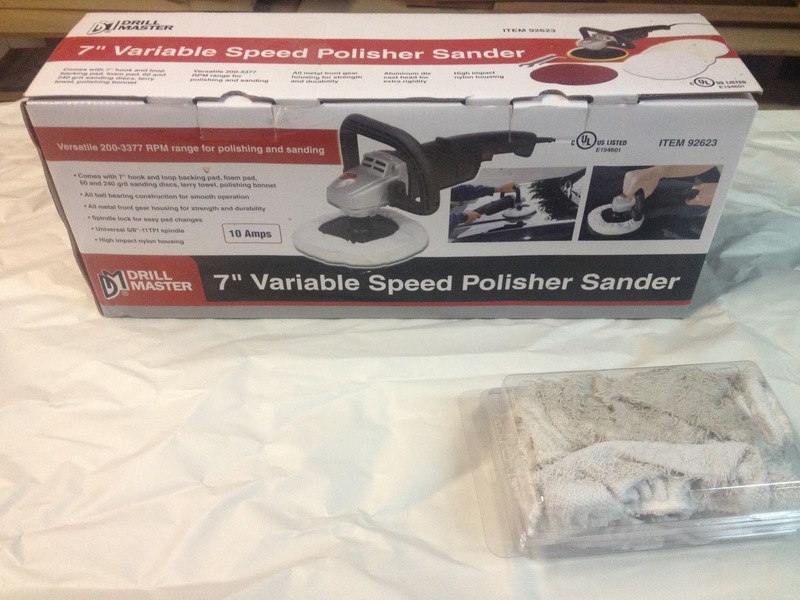 Spot sanding will not cut it, because you’ll miss scratches. You have to sand the entire window. 1. Put on some music; this will take a while and you need to be in the mood. 2. Cut the sandpaper into strips that can fit around an old sanding sponge if you don’t think you can do even job with your hand. I used my hand and kept it very flat so I got good coverage. 3. Dip the paper in water and sand in a back and forth (not circular) pattern. Rinse off the residue regularly. I went back and forth 5 times in a line, then moved over a bit and started again. I changed sandpaper after I got across the window, then went back and forth in a perpendicular direction. 4. Move on to the next grit. 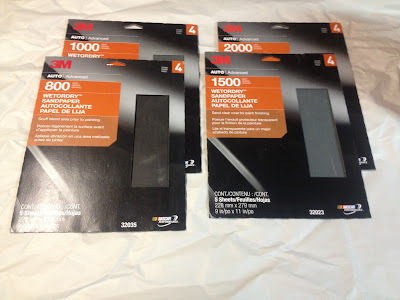 I went in the following order 600 or 800, then 1000, 1500, and 2000. 5. 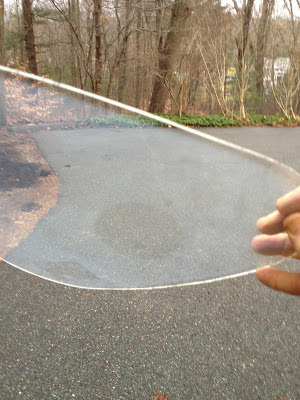 By the time you are done with this sanding, your window should look like a piece of frosted glass or beach glass, with no scratches discernible with your fingernail. 6. Now you need to polish. Plastic Pen polish is not aggressive enough to clear the window at this point. You will need to use white polishing compound. 7. With your helper holding the window, start polishing with the polisher and white polish. I used a $29 7” polisher from Harbor Freight Tools. It is your typical inexpensive, value-engineered, Chinese-made tool, but HFT has a 90 day no questions asked warranty. You can use it and abuse it for 90 days. By the time I was done with my windows, the bearings were a bit noisy! 8. Switch the polishing bonnet, and then polish with the pen polish. By the time you are done you’ll have nice feeling, scratch free windows!